Sound engineers always tried to development an amplifier wich can produced a pure and clear sound. Also they developed devices that the guitars let sound quite otherwise. The effect equipment can the guitar let sound like a pinao, organ, sax or a circle saw, jet plain or even not natural noises. A gitarist with an effect device can be better sound, if he knows how to handele it. There are people who put the pots full open, so their average playing is now real a disaster for the ear. The difference between an example Jimi Hendrix, Slash and Mark Knopfler or an average guitarist is more than just an effects unit. With a distortion, you can produce a delicious smarting noise, but you can also create a chaotic stew of which nothing is more distinguishable, how good you may play as well. Effect equipment cannot compensate the lack at talent and technique. A tremolocircuit is an amplitudemodulator that produces small differences in the volume of the signal. The amplitude is regulated with a button that mostly has been indicated with 'depth'of 'intensity'. You can get a sound get that variated from a flowing wave movement till a brief echo repetition. The intervals between the maximum stand out of the sounds strength is regulated with buttons that be indicated with 'speed', 'frequency' or 'rate' with a velocity approximately in 2 <> 8 cps. Many tremolo's are foresee with a field effect transistor, better known as FET. Also there are tremolo's that works with help of a fotocel, light dependent resistor (LDR). Because the tremolo-effect many resembles that of a vibrato, they often become exchanged. 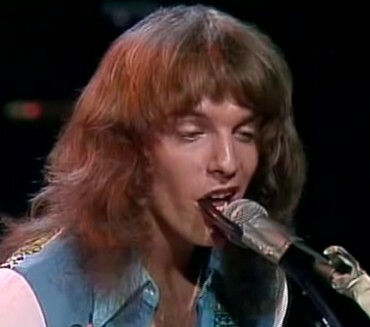 Also some people call the handle of guitars, as on for instance the Stratocaster, 'hand tremolo'. However, this thing is named a 'hand-vibrato' or 'arm-vibrato'. A vibrato circuit will make a variation of the pitch (not the volume) of the signal. The number of effects and controls are nearly identical at that of a tremolo. You can make the intervals longer to insert an extra resistance for the potmeter or replace the potmeter for one with a larger resistance. 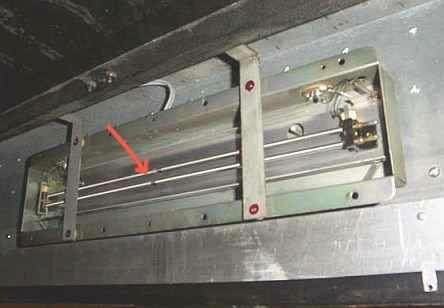 The mechanical reverberation device takes advantage of two metal springs through which the electric signal led. The electric signal is converted into a mechanical pulse which is sent through the spring and wil at the end of the spring converted back into an electric signal again. One metal spring causes a delay of approximately 29 milliseconds and the other one 32 up to 38 milliseconds. A part of the signal is led round the springs away and steered directly to the amplifier. This direct signal is the first you hear and the springs ensure the delays effect. A part of the signal can also be trhough the springs again, so it creates an an echo-effect, that will be slowly fade out. You can imagine reverberation as a serial echo golves wich are repeat so fast that the interval are not audibly. The intensity is regulated with the 'depth' button with which you the balance between the direct signal and the signal of the springs can regulate. In a low position the reverberation effect does think of the sound in a concert hall. In the high position the reverberation ensure for continuous sounded as if it comes from a long tunnel. Important to be insure that an amplifier with reverberation springs or reverberation equipment stands safely, so that there can not kicked against or beaten it! You hear then a loud detonation that arises because the springs clap against each other. The most applied reverberation devices are no longer mechanical but entirely electronic and no longer know this problem. The wah-wah, a pedal for on the floor, is in fact a kind of tone regulator that the sound alters from high to low and reverse. You must adapt the playing if you want to use a wah-wah. The coordination between your hands and feet must be optimum, if you wants to get the correct impact. In this last example the guitar is played by Melvin M. Ragin, perhaps well-known better as Wah Wah Watson. Most wah-wah's are solid built and wil not go quickly broken. The best results you will be get if you move the pedal slowly, so that the sound goes gradually of low via middle to high, and reverse. A fuzz or deformer is a simple gadget which create effects gets varying of a oversteer amplifier till an continue creaky buzzer. The fuzz changed the signal of a round sinus into a saw tooth sinus with as result the sound sounds deformed. The electronics is built in a metal box that is admision between the guitar and the amplifier and can be turned on and off by means of a foot switch. The fuzz has generally two regulators, one for the volume and one for the intensity of the effect. This last regulator is indicated with 'fuzz', 'distortion' or other synonym for intensity. There exist however also fuzzes with more regulators. The intensity rregulator is the most important part. Some fuzzes have a bad intensity corrector, in fact not more then you can turn the effect on and off. By the fuzz you get more sustain but there also models by which you can adjust also a deformed staccato sound. There also models that see to for sustain without distortion. An advantage of this is that every tone well audible remains. Known marks of fuzzes are, Knows Foxx, Woods, Electro-harmonix, MXR, Vox, Ampeg, Ibanez, Fender, Maestro and Kent. But there are there still much more. Many guitar players love to turn an amplifier full open to create so a natural distotrion. A not recommend method because the tubes or transistors of the amplifier and the speakers overload it and because of this serious damaged cause, or even be can blown up. The offer at echoes, an unit that sounds as an echoput repeats, is enormous. An old type but still frequently uses, works with an infinite tape, a recording head and a reproduction head. (Tape echo) The first head receives the signal and recording it, the second reproduced the signal and the first head recording that same signal again so an echo arises. Extra reproduction heads see to of extensive possibilities. The delay can be adapted by changing the distance between the heads. If the distance small is, and the interval of the delay thus also, will there a reverberation effect arise. Also it is possible regulate the tape speed to do arise still other effects. A tape echo demands much maintenance, the heads must be cleaned regularly and the endless tape will have be also replaced as the sound of quality will become more badly by wearing off. Known marks of this type of echo van dit type echo device are Dynacord en Roland. There are also electrostatic units which works without a tape but is foreseen of a magnetic disk or round bus, on which six heads has been introduced. The possibilities are highly expanded and these devices are also extremely reliable. But by far the most applied echo devices works entirely electronic without moving components and can with help of the digital technique spectacular effects create. you can for example add extra tones that deviate from the original. Aguitar has a large dynamic spectrum, which varies of extremely gentle tones up to and including hard touch a chord, what can cause a problem for the amplifier.If an amplifier is so adjusted that it gentle tones is well reinforced, it can be that the hard tones will deform. The other way around, gentle tones will be scarcely audible if you adjusted the amplifier that hard tones get through well. This produces especially problems at recordings, because the recorder has its own limitations to aspect of the dynamics. A compressor blunts high sound picks and obtains deep sound valleys on, as a result of which there no extreme output differences anymore. If the compressor receives a hard, sharp tone he blunts the peak and sees then that the amplification increases gradually, so that the tone does not fad eaway but longer rings through. By a good adjustment, this proces sees to for more sustain without, or with little, distortion. The compressor sees to for a more constant signal, where the sharp sides fetched down. Because of this generally a harder signal is possible, through which also the subtle things which otherwise will lost to be audible. To reduce the noise, you must adjust the compressor well. These devices accentuate particular frequencies. 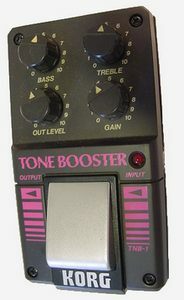 There are several types: bass boosters, trebble boosters and combinations of high and low frequency boosters. A booster amplified tones, or in a certain small frequency area, or the tones of all frequencies above or under a certain point. The first see to for one spot in the frequency curve, while the second will see to from that particular point for a high line. A Talk Box, also known as Voice Box, is a small box, and becomes placed on the floor. Envelope hits on the horizontal outline of a tone, what will say the attack, sustain and decay. Thanks the synthesizertechnology, it was posible to develop external envelope modifiers, wich added various elements at the effects tricks. The mostly used effect is the electronic wah-wah. Here the guitar signal wil be convert in a similar tension that activates a filter. The intensity with which the string is hit provides also the intensity of the filtering, by which the effect take off as the sound fade away. The guitar sound get convert into wah's, wow's, bow's, kwaks and tweety sounds. Popular envelopes modifiers are the Funk Machine from Seamoon and the Mutron 111, under others used by Stevie Wonder. Sub sounds can be caused by everything, from amplifiers, instruments, cords, effect units etc. 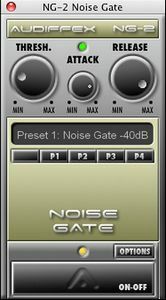 A noise gate works like a compressor as a kind of narrow port, but squeezes the signals above a certain preset level no, but provides instead for signals below a certain level does not come through. This means that even the softest tones are harder than the unwanted noise. You set the controller which provides you the threshold so that the softest tones along it could, but that all signals below the threshold are excluded. You have exactly the set threshold. If it is too high you will still suffer from noise and low as he will be the soft passages not let through. If an amplifier to strengthen signal a soft guitar, he also noise reinforcing. An external preamplifier, the signal pep before it reached the amplifier, so this issue is largely resolved. A preamplifier can also be used for an amplifier to overload. 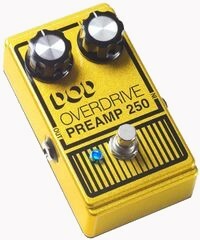 Because the preamp than will deformation it often compares with a fuzz or scrambler. It is so that a fuzz prodices distortion at itself, while the preamplifier causes for signal purity causes, provided it is sufficiently high, the amplifier allows deformation. If you have a scrambler searches, try an external preamplifier. Some manufacturers install amplifiers inside guitars to get more options. The pulsating vibrato of the Leslie is one example of the Doppler Effect. A phenomenon in the propagation of sound waves which show a higher level when a sound source and observer approach each other and lower when the distance between them increases. An example is approaching and passing of a honking car. Higher and lower the tone created by the distance that the sound waves must travel always changing. 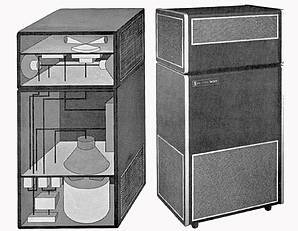 The Leslie Speaker rotates in a closet; the tone seems highest when the speaker forward is in the direction of the listener because the sound waves than the shortest distance to travel. The tone seems lower when the speaker is back addressed to the listener off. Because the speaker turns hovering around the pitch between the two extremes resulting in a kind of phase shift occurs. A tone is a complex structure of harmonics. Because of these different wavelength is the Doppler Effect to the complex and an additional noise dimension. The term phase is used for the synchronization of sound and electrical signals to measure and display. The peaks of two waves are in phase, go in tandem, the combination strengthens the overall signal. If two waves contrast are perfectly out of phase, that is when one is at its peak and the other on his depths. In this case the waves are up (180°) from each phase and will positively particle wave above the center line completely eliminated by a single negative wave particle under the line. They therefore cancel each other, the result is: no sound. Between these two extremes lie many natural phase differences, which all provide specific patterns because they eliminate certain particles and reinforcing. These patterns are often defined in a graph with the graph on a ridge seems like the very pointy peaks are mutually supportive and close to each other. A filter that brings about such effects is therefore a bridge filter (bridge filter) called. The Leslie is best known in conjunction with the Hammond organ, but also for the guitar gives a fantastic effect. The phaser was originally designed to Doppler Effect of the electronic Leslie mimic, but now the device to its own specific sound, that somewhat resembles the sound of the wind or a jet taking off. In a phaser are called voltage-controlled filters made that the phase of incoming signals change. The various phase relationships to eliminate some mixing waves each, while supporting and reinforcing each other. Each pair takes part filters of the task. The more filters there are a phaser, the deeper the impact will be. An oscillator surging up and down on the bandwidth and move the elimination point. This causes sound like a fierce wind. The speed of this wave motion, even named 'sweep', is regulated by a potentiometer which is usually indicated by 'speed', but it can also happen with some preset switches or with a pedal. In some units are part of the signal again led by the phaser. This feedback creates a sound with more complex harmonic structure that phasing effect even more highlights. Flanging owes its name to a technique that, at the end of the fifties to first in the studio operation. They used two tape recorders bearing the same recording and let them play in sync. They pressed with the thumb against the rim (flange) of the coil which the band is, which one recorder was not completely synchronized with the recorder and a second phase shift occurred. An electronic flanger has an analog delay line to create this phase shift. 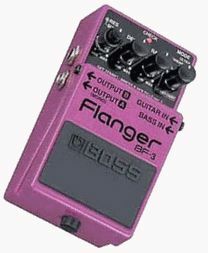 Flanging is more like the known studio phasing than the sound of a phaser. The effect is also constant so you keep sustain reserves. The more complex the signal, the more intensively the flanging effect. The ring modulator is a complex effect of the devices, which carillon-like harmonic produces tones whose intensity is adjustable. If you play a 'lick' on your guitar, harmonics can run in the same or opposite direction. You can use the device so that you only just can hear the tonic or synthesized overtones, where in between many natural variations. The ring modulator creates spacy, incoherent sounds that it is sometimes difficult to play. 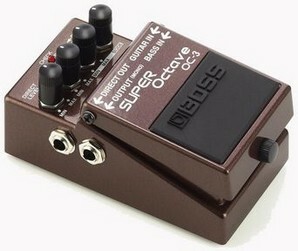 Since the popularity of the electronic music, several compact synthesizer units for guitarists are available. One of the first was Hifi from EMS. With this unit, equipped with two pedals, all kinds of effects can be to produce: fuzz, sustain, phase, Frequency modulation, wah-wah, vibrato etc. 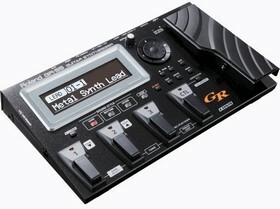 Other versatile units are the G-2 Guitar System from Maestro and the Mode Synthesizer from BCM. But also the other leading brands impact of equipment have their own console systems. Actually this instrument should not in the list of devices to effect the guitar, but it is worth it just to describe because it is such a special case. 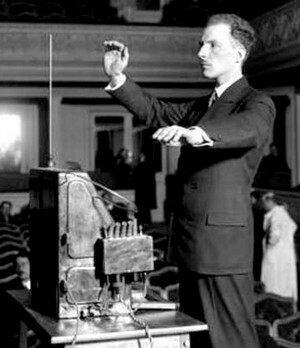 The Theremin is an electronic oscillator/musical instrument is named after its inventor, Russian professor and musician Leon Thermin. The instrument was developed in 1920 and consists two electrically charged rods connected to a high frequency circuit. It is played by moving the hands above the bars, with one rod controls the pitch and the other volume. The hands do not touch the bars, but it uses the electric tension of the human body. Also, the instrument was used in films, especially horror and thrillers. In Spellbound a film by Alfred Hitchcock from 1947, is first time the Theremin was used.. The Gizmotron was designed by the former members of the band 10CC, Lol Creme and Kevin Godley. The device can in principle be mounted on the bridge of any guitar. In the unit are six wheels (or four for the bass there is a special version), one for each string, which can rub the string, making a cello-like sound. The number of wheels that is activated depends on the number of buttons on top of that Gizmotron is pressed. It remains possible to strike the strings with a plectrum. Examples of capabilities of the Gizmotron be heard on 'I'm not in love' by Ten CC and the albums 'Consequences' and 'L' by Godley and Creme. The octave divider or splitter adds a tone which one or two octaves lower than the tone you play. This hear it like a bassist and guitarist simultaneously play the same. Many guitarists, however the problem for the units to operate continuously, they are sometimes triggered by an overtone instead of the fundamental and sometimes the added tone sounds distorted. Some units are very sensitive and react to the smallest attack differences. It is also possible that the octave circuit is disturbed as you playing chords. The result is a slurry of a sound which nothing more from each indistinguishable. Dividers better respond to constant signals such as a or sax or trumpet. Despite the weaknesses in the divider can get a funny effect that sounds fairly clear. Octave distortion multipliers are special units that add a tone which one octave higher than the original. There are several options for linking effects units, but each connection has its advantages and disadvantages. To increase the output level without creating too much noise, first the preamplifier and then the compressor must connected in the chain. A fuzz or ring modulator can follow them, but it is advisable not to link it in row but beside each other , so you can choose one or the other. This way you avoid an extra link in the chain, what is more important than the nominal benefit to these two effects units (both the signal 'maim') to run concurrently. Then the envelope modifier and wah-wah, or beside each other. The signal remains stronger. Remember that the envelope modifier will react differently if you switch the fuzz or compressor on. A phaser you always the best places at the end of the chain because he harmonic complex input signals are best processed. Finally, the echo and volume pedal. If the pedal behind the echo, you might like the tone is gone keep the echo. And if you have them switched the other way, you can use the pedal to regulate the echo level and the overall signal. It is certainly advisable to use a volume pedal so you level differences that arise when you use certain effects in a row, you can compensate. The first electronic components for the guitar had several disadvantages, such as the fact that the devices are not always fully worked on the jagged guitar signal. Differences in dynamics were also not happend, so an important part of the guitar lost. Today there are systems that all possibilities of a guitar synthesizer to give, without the essence of the guitar is affected. There are guitars with special circuits, interface units and complete systems. Synthesizer units are generally designed for solo or single string work and not for the accompanying chords. The polyphonic units processing chords good, but the monophonic are confused which may result in losing the harmonic structure of the chord, or that only the last note is wil heard. If you hit the tones of a chord one by one (arpeggio technique),the circuit responds appropriately. An interface unit is not a synthesizer, but a link between the guitar and the unit, that will the capricious impulses of guitar turnover in signal suitable for the synthesizer unit. So the analog signal from the guitar is converted into digital (binary) code by the interface. One example is the solid state Slave Driver by Bob Easton's 360 Systems, which consists of a six-channel component, a box and a cable. In the box are located a pitch-to-voltage converter, which turned a pitch into a corresponding voltage, and an envelope follower (loudness-to-voltage converter). The complex front panel includes an octave selector and a preset interval. The pitch of the interval is set on the Slave Driver and sound and effects on the synthesizer unit. 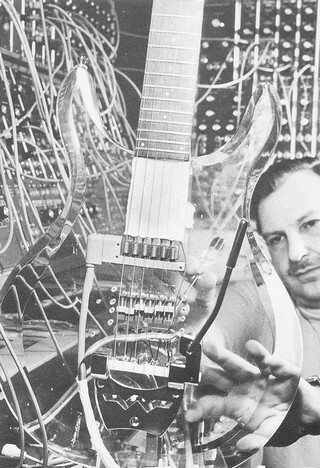 Walter Sear built once a polyphonic guitar synthesizer which comprises a solid-body 'Dan Armstrong' plexiglass guitar, an element with six segments and a synthesizer unit. A major advantage of the polyphonic unit is, the effect that you can set separately for each string, so you can make great harmonic structures. ARP Instruments has been for over years an innovator in electronic instruments. Their beautifully designed Avatar guitar synthesizer unit offers a virtually unlimited number of different effects. The six channel element is connected to a preamplifier, the sensitivity for each string is individually adjustable. The unit is similar to the popular ARP Odyssey and has foresee of the necessary number of VCO (Voltage Controlled Oscillators), VCF (Voltage Controlled Filters), envelope modifiers and other synthesizer components. All guitar techniques are fully realized in this design. Among other Pete Townshend made use of this unit also. There is also a system which built in the electronics in the neck of the guitar and that will be activated by contact between the strings and frets. The Hagström Patch 2000 uses this system. There is one unit for both bass and guitar.